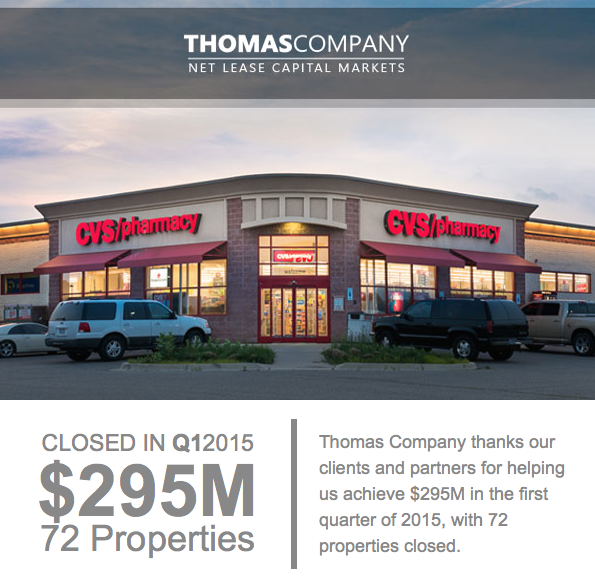 Thomas Company announces our 2015 first quarter results, with 72 properties sold for a total of $295 million. Thomas Company provides single tenant, net leased investment brokerage and capital markets advisory nationwide. With over $5 billion worth of single-tenant transactions successfully executed, we have delivered superior results for our clients. Our clients include public and private REITs, equity funds, developers, private and institutional investors, corporations (publicly and privately held), private equity firms, investment banks, family offices and high-net-worth investors. Thomas Company has developed an international distribution network of real estate investors and advisors that include active professionals across 50 states and 5 continents.